Deep in the woods on a property just outside of Browns Flat, the ground is dry and carpeted by papery autumn leaves. It does not seem the best place to light a fire that will burn at more than 1,200 degrees C. And yet potter Darren Emenau insists there is no danger. He has done this before, even by himself, stuffing pile after pile of kindling into the outrageous temperatures of the homemade kiln, which he built two years ago almost entirely from scavenged materials, in the forest near the lower St. John River. The potter, whose work is sold in fine galleries across New Brunswick and is currently part of a travelling craft exhibition touring the Maritimes, became bored with the more common electric and gas-fired kilns used by many potters, kilns that are safe, clean and do not require the enormous physical efforts required by the wood-burning type. Emenau, 37, who was born and raised in New Brunswick and graduated from the College of Craft and Design in Fredericton in 1997, is always experimenting. Once he masters a style he moves to something more challenging. His work — on the strength of the playful human and animal cartoon characters in his Whimsical line – began gaining notice about 10 years ago. When he grew bored of that motif, he created Japanesque, a series of linear pieces with clean lines, glazed in rich shades of black and blue, or natural browns and greens. In recent years, Emenau has turned to the land around the home and studio he shares with his partner, the painter Alexandra Flood, in Lower Greenwich. Their spot is a gorgeous rural stretch alongside a creek, and from it he draws inspiration and raw materials. Here, and elsewhere, he digs native New Brunswick clay, crafting it into plump urns, smooth pots and wonky tea pots glazed in flakes and splotches that reflect the nature around him – lichenous greens, woodsy browns, rusty oranges. On a Saturday night in October, Emenau invited six of us to share the experience of firing his wood kiln, a process that started at 5 o’clock in the afternoon and carried on well past midnight. Emenau never earns in money what he puts into his wood kiln in time and sweat. Just preparing for the firing takes a full day of chopping endless lengths of wood into kindling. There is the time spent gathering and working the clay, turning pots on the foot-powered wheel in his home studio and glazing them with New Brunswick materials – potash from Sussex, granite from Queenstown, limestone from Saint John. it took months to build the log shed that houses the kiln in the woods behind his house. For Emenau, the uniformity and ease of use provided by an electric kiln is fine for his production-line dishes, mugs and vases. But the real art of pottery lies in wood firing, a process that is labour-intensive, time-consuming and potentially problematic. What wood firing lacks in efficiency and consistency, it makes up for in experimentation – yielding astonishing, gorgeous results. “I really just constantly want to be surprised,” he says. Until he opens the kiln the day after the firing, when the clay has cooled enough to be handled, and then only wearing thick leather mitts, Emenau can only guess how the wood smoke and salt reacted with the glazes he put on his pots before they were baked, or how the glass he put in the bottom of bowls will have melted and glazed the vessels. Me and joel Hooper at the early stage. At more than six feet high the kiln, a dense rectangle of soft clay bricks about the size of an industrial fridge, looms over us. It is held together with chicken wire and a couple of clamps. Despite a charred blanket of fire-retardant fabric strapped to the outside of the kiln, licks of flame dart from burning red seams. It is not a stretch to call the setup haphazard. No fire department in the world would pass the structure in a safety inspection. As the evening wears on, the aluminum roof grows warm, and then several hours later, hot to the touch. My paranoia grows. “Um, is it safe?” I ask, trying to sound nonchalant. Local Kaolin preserved between layers of silica sand. When we arrived, just before dark, the kiln was already burning at more than 815 degrees C. We were charmed at the warm light and comfy heat thrown by the fire in the hearths on either side of the kiln. We settled on benches around the kiln, sipping beer in the cabin’s toasty interior. Soon, that coziness turned to a deep, sweat-inducing heat once we actually start helping the potter with his work. The laid back, rustic vibe dissolved into a scene from some pre-industrial revolution workshop, or a vignette from Dante’s Inferno. At the hearths on either side of the kiln, teams of two take turns feeding the fire and raking the coals, shuffling them evenly across the metal grate, as Emenau, now bare-chested in the roaring heat, moves from side to side, offering pointers. On a night such as this the kiln will devour about a cord of wood. After a few minutes tending the coals, the heat is nearly unbearable. Then Emenau announces it is time for a reduction, blocking the chimney to starve the fire of oxygen, which will result in rusty markings on the clay. With no exit, the smoke builds inside the shed, a dark mass roiling below the ceiling like a stormy sea. After three hours of feeding a voracious fire we are on cone eight. Emenau has a thermometer, but he does not trust it, corroded as it is by salt and smoke. Instead, he takes his true reading from small pyrotechnic cones sets inside the kiln that disintegrate at increasingly high temperatures. For this firing, he was aiming for a grade 10 cone, which crumbles at 1260 C.
Finally, at almost 1 o’clock in the morning, it is over. And so are we. Sooty and tired, we drive home to Saint John. The muscle aches seem worth it, though, when Emenau sends photos a few days later of the finished work. It is gorgeous. 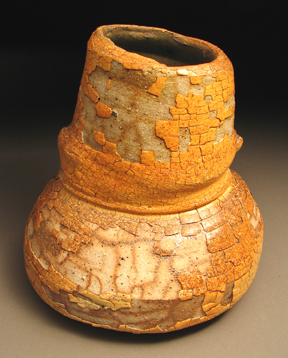 Darren Emenau will host his annual Christmas pottery sale Dec. 8 from noon-6 p.m. For more details visit www.mnopottery.com.